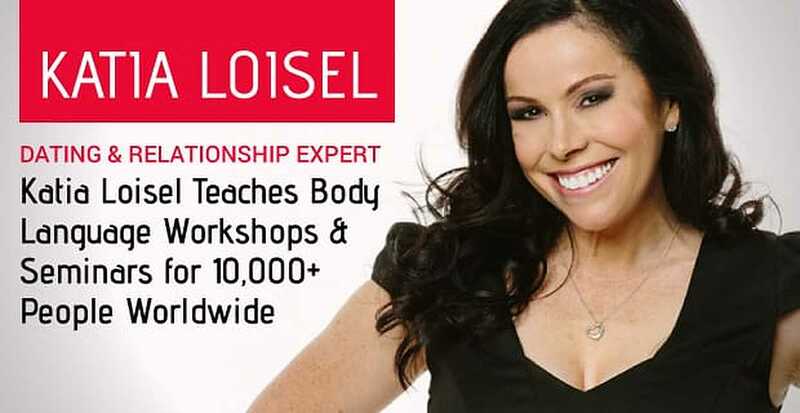 The Short Version: Katia Loisel, an internationally acclaimed expert on dating and relationships, helps singles master the art of body language and flirt more effectively on a date. Over the years, Katia has designed and conducted hundreds of keynote speeches, workshops, and seminars to impart her relationship insights to over 10,000 people worldwide. She also works one on one with singles who are having dating difficulties and provides specific feedback about the nonverbal cues that can make or break an emotional connection. Furthermore, through her global media outlet, The Love Destination TV, Katia reaches millions of women through video content and words of encouragement and empowerment. Katia teaches daters about body language to give them the skills to make an attractive first impression and feel more at ease in the dating scene. Growing up in Australia, Katia Loisel felt insecure in most social situations. She considered herself a shy extrovert, often going out to mingle with people but unable to overcome her own doubts enough to build strong relationships. In her early 20s, someone told her she was coming across as standoffish and snobby. People were reading her body language as aloof, which kept them at a distance. Katia Loisel, Founder of the Love Destination TV, coaches singles in motivational speeches, seminars, and workshops. Katia began by simply smiling more often. And she found people often smiled back. Her confidence grew as people changed how they viewed her and therefore how they behaved toward her. She found it easier to make eye contact, start conversations, and build relationships. Inspired by the positive feedback she received, and after studying everything she could get her hands on, Katia wanted to empower others to connect, become more conscious of nonverbal signals, and improve their love lives in the process. She conducted a five-year global study on dating and mating patterns before co-authoring “How to Get the Man/Woman You Want,” 400-page book which made thoughtful conclusions about dating. In 2009, Katia decided to share her insights on social success with singles worldwide and launched an instructive “How To” series on YouTube. Her cheeky videos focused on central dating topics and generated over 12 million views in six months. Katia’s story and its lessons resonated with daters looking to improve their love lives and make stronger first impressions. Today, she conducts impactful one-on-one coaching, workshops, and seminars to speak to tens of thousands of women around the world. Her central message is that dating success starts with examining and adjusting your own behavior. Going into a date with a positive attitude can make all the difference in the world. On a first date, many singles are a bundle of nerves. Sometimes they get so caught up in their heads about what to do, what to say, and how to act that they fail to make an authentic connection. Worse still, flopping on a date can further harm their confidence and make them even more nervous the next time round. It’s a vicious cycle that Katia’s dating coaching aims to end once and for all. In her speeches, Katia focuses on how to make a strong first impression and explains the nonverbal communications that can slip people up. Her deep understanding of body language has made her a much-sought-after dating expert for seminars, conference panels, and one-on-one coaching sessions. She has been interviewed over 1,000 times by top media outlets, including “The Morning Show,” “The Daily Edition,” and ABC. Katia explains the nuances of body language, flirtation, and relationships in clear terms, backed by years of research and study. She runs a free Body Language of Flirting Bootcamp for anyone seeking hands-on help and professional-grade online resources in the love department. Throughout her career, Katia has worked with over 10,000 people and given over a hundred keynote speeches about body language and dating. She can expertly dissect a person’s body language and nonverbal cues, and she provides helpful feedback to daters wondering what’s going wrong in their love affairs. Currently, this acclaimed dating expert is developing 18 television shows for the Love Destination TV, her multi-platform global media network. The Love Destination TV offers online courses and engaging shows about matters of the heart. Katia founded the love-focused media network to “conquer loneliness and disconnection” by speaking about subjects close to the hearts of women everywhere. It’s a compassionate outlet dedicated to spreading love and positivity. In fact, 15% of all Love Destination profits go toward charities. Many have praised Katia’s motivational speaking style. Oftentimes, she injects a bit of light humor into her speeches and positions herself as a down-to-earth expert in emotional subjects. Her positive attitude, personal story, and spot-on analysis encourage people to take steps to change their lives. She told us the story of how she helped one introverted research scientist come out of his shell and find love. He was going to a barbecue hosted by a friend and thought he would stick out because he was older than everyone there. Katia challenged the single man to start a conversation with the oldest and the youngest person at the party. The dating expert told him not to worry about being cool or getting a date, but simply to give his attention to the outsiders of the group. He ended up having an amazing conversation with a young woman at the party. They dated and are now happily married. Katia is a great at driving her point home with her audience and giving them helpful insights to apply to their social lives. “Your comments were spot on the mark – exactly what we wanted!” wrote Catherine Milford, the Deputy Editor of Woman’s Day. Decades ago, Katia shied away from the spotlight and cringed at her own social awkwardness. Now, she feels at ease in front of hundreds of eyes and shares her tricks for becoming a more confident, accessible, and date-worthy person. Her body language expertise gives singles the tools to flirt more effectively and communicate who they are without having to say a word. Through her workshops, seminars, speaking events, and media outlet, Katia sends an empowering message for daters seeking to turn their love lives around. Her positive encouragement and personal experiences inspire people to follow her lead and take control of how they’re perceived in social situations, including on dates.